Pictomio is a beautiful picture and video organizer that comes with a wide variety of features and an impressive looking interface. 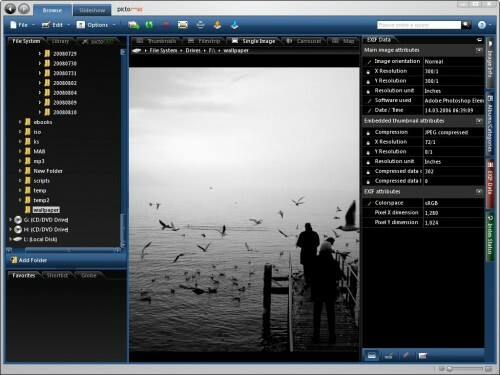 The photo software uses a library like system to catalog images that the user adds to the application. Those images can be sorted and grouped in numerous ways, for example by rating, file size, date or type. Importing new photos into the application can be done easily. The user can use the navigation pane on the top left side of the application to select folders that contain images from his hard drive or use the Import function to pick folders that way. Photos that get imported are automatically categorized and sorted. It is for example possible to browse the photos by year after importing them. Some categories like the rating category are empty at the beginning and will be filled when the user begins rating photos in the library. One interesting category is to view the images by equipment model which would be really great for photographers who use different equipment for different purposes. Other options include to view photos by copyright holders, software, exposure time, flash and about a dozen more categories. Images can be viewed as thumbnails, image strips, slideshows, single images, flip-book like or on a map that is showing their geographic location. This photo software has so many functions that it is hard to keep an overview over all of them. One feature that is missing are those basic image editing functions that most other image viewers posses. It is not possible to resize an image and save it on the computer afterwards. Pictomio raises the bar for other image viewers with its beautiful interface and image viewing functions. It does lack behind in image editing options and suffers a little bit from the amount of functions and features the developers have packed into the interface. There is another drawback. Beauty has its price and users who like Pictomio simply because of its looks will have to cope with a much higher computer memory consumption as in related image viewers. Pictomia is available for Windows XP and Windows Vista in version 1.0 and as technology preview version 1.1 which includes the Pictgeo software add-on which adds geotagging to the photo viewer. 1. It doesnt look that good. It doesn’t integrate properly with XP and has many rough edges, more like a beta. 2. Uses loads of RAM: It uses too much ram for basic twirling effects. It is the CRYSIS of imageing softwares. Even Compiz doesn’t use 10th of it. 3. Other softwares are better: Windows Live Gallery is the best (panorama creator). So is Picassa.